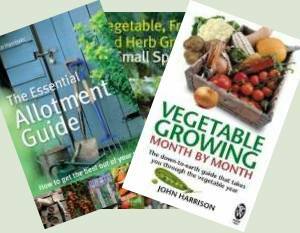 Home › Composts & Fertilisers › Mulching with cardboard or paper and grass clippings. 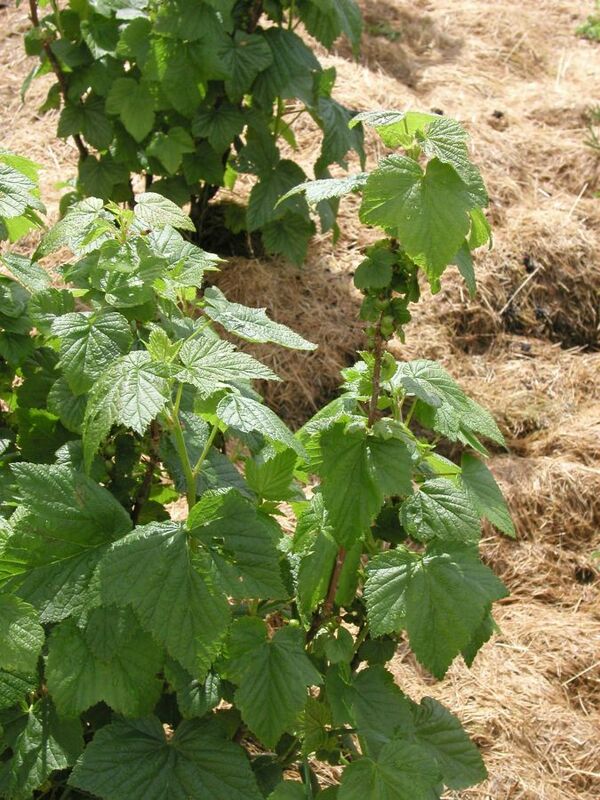 Mulching with a layer of cardboard or paper under grass clippings is a labour saving way to suppress weeds whilst naturally improving soil quality. Mulching is a great way to prevent weeds growing whilst improving the soil. I mulch under fruit trees and bushes and in the decorative shrub border. One or two layers of corrugated cardboard or three layers of paper are laid onto the soil surface. As this is likely to blow away when dry and windy, cover with grass clippings. The worms seem to especially love corrugated cardboard. It’s always good to get them working away for you. As the card or paper disintegrates it adds its carbon directly into the soil. Then the grass clippings get drawn down and eaten as well. The improvement to the soil is tremendous. Initially our soil was very poor with hardly a worm to be found. Not surprising when there’s little organic matter for them to eat. After mulching the worm population increases and the rest of the soil ecology along with them. They’re busy concentrating nutrients in their gut so worm casts are perfect for plants. The tunnels they create are also extremely valuable in this process, enabling oxygen to get down further into the soil. This aids both the plant roots directly and fuels the aerobic economy of the soil. It’s a slow process but after just three years the difference in the soil is obvious. It’s darker, deeper and richer. Mulching and the worm tunnels also improve the way the soil handles water. In heavy rain, rather than running off water is absorbed by the mulch and released more slowly to the soil below. Then the worm tunnels make sure the water percolates down into the soil, being held by the organic matter like a sponge. This is of great value when there’s a cloudburst in an otherwise dry season. In hot weather mulching prevents evaporation from the soil. However, water sitting deep in the soil will be drawn up the tunnels and spaces by capillary action to the plant roots but not to be lost to the air. It is possible to grow through mulch but not from seeds which will be, like weeds, prevented from germinating. Plants started in pots or modules can be transplanted into holes made through the mulch – including the cardboard. They will have the benefits of more available water in dry weather and generally do well. But, and this is the big problem, mulching this way with grass clippings and cardboard provides a perfect habitat for slugs. This slug problem rules out most crops like leafy brassicas that otherwise would benefit from mulching. Runner beans will certainly benefit from mulching as they are little bothered by slugs. Broad beans can benefit from mulching between the double rows too. Mulching with cardboard and grass clippings is a good way to put a bed to sleep for the winter. The soil below is, of course, kept weed. More importantly the temperature of the soil is moderated in freezing weather. This enables the worms and rest of the life below to carry on longer and start earlier come the spring. The soil improvement referred to above is noticeable. When you’re ready to start sowing and planting in the spring, any remaining clippings can be raked up and composted. If you’re breaking new ground, perhaps converting a lawn area to vegetables or even a plot in a field, this method can be helpful although a slow process. 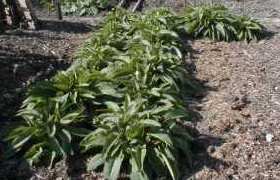 Start by removing any perennial weeds like docks, dandelions etc. as they’ll most likely force their way through the mulch. Next take a fork and insert it vertically into the ground, then pull it back to about 30º which should lift the soil a little and open it up. 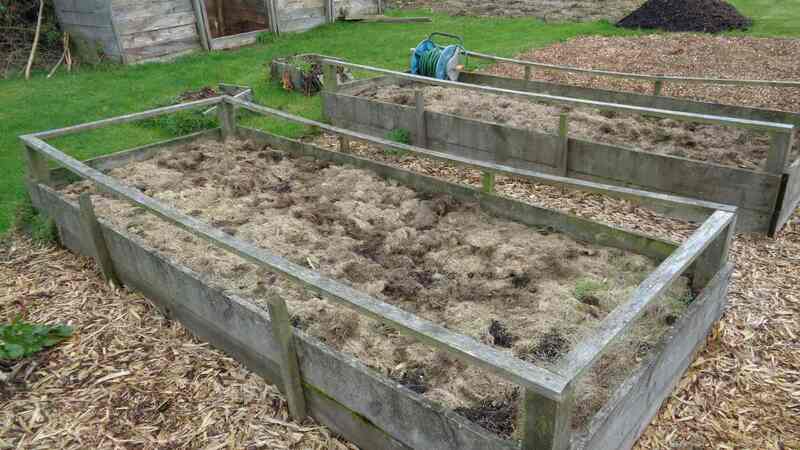 If you happen to have any manure (rotted or fresh) handy, spread a layer of that before covering. Cover with a couple of layers of card or half a dozen sheets of paper, overlap them where one piece meets another. Cover that with 10 to 15 cm (4 to 6 ins) of grass clippings. Leave for 6 months and the weeds or grass below should be dead. The soil will be somewhat improved and you can work it more easily. If your soil is light and you have compost, just put a layer about 5 to 10 cm deep on the bed and start sowing & planting. With a heavy clay soil I’d recommend double digging. What Cardboard & Paper Can You Use? You can use coloured matt cardboard or paper. There used to be some concerns about the inks used in the past but these fears seem to have been groundless. If the lawn has been treated with a weed ‘n’ feed type product which contains a selective broad-leaf herbicide, do not use the clippings for mulching. Read the instructions on the packet carefully for information of toxicity (to plants) and how to dispose of the clippings.